One of my favorite parts of my job (and one of the most time-consuming) is teaching Confirmation Class each school year for our 8th graders. · Time for students to consider their baptismal identity and “confirm” the answers to the baptismal questions that were answered on their behalf when they were babies – or even for a student who has yet to be baptized to understand what it means to be baptized and to receive the sacrament at the end of the class. · Time for them to explore the particulars of their Christian tradition – what does it mean to be Presbyterian, Lutheran, Catholic, etc? · Time to move beyond the Bible “stories” to biblical theology, looking at themes of sin, forgiveness, grace, exile, calling, hope, resurrection, discipleship, etc. · Time to prepare to take on the role of an adult member of a congregation, discerning the gifts that God has given them and how they will use them to contribute to the community. There are a lot of ongoing conversations about how Confirmation has turned into the real-world scenario I have described and what we can do about it – improving children’s education programs, having students move through Confirmation at an older age, or better equipping parents to teach their children more basics at home. There are also many conversations among church leaders and pastors about how busy children’s and families’ lives have become with school, sports and other extracurricular activities. Time that in the past had been set aside to participate in education at church is eaten up by other activities, and it is rare that a family spends intentional time at home reading the Bible or talking about faith together. Yet the desire for children to participate in Confirmation programs does not waver. In my congregation we have batted around a hundred different ways to deal with these issues, and none of them seem to be a perfect solution. In an attempt to wrap my head around my disappointments with what happens in Confirmation, I have compiled a list of 100 things that I wish students knew BEFORE they stepped into my Confirmation class, and I will be sharing them here over the next few months. Click here to see the entire list. In my own context, this may result in shifts to how and what we teach children in our Sunday school programs. Maybe it will mean that we choose to delay Confirmation until students can grasp all of these pre-requisites. Maybe it will mean that parents will need to have these conversations/teach these lessons to their children in the home. Because this blog is oriented toward equipping parents (and other adults) to talk to their children and teach them about faith, I will move through this list (in groups of five) in that context, sharing ways that either through simple conversations or a habit of cracking that children’s Bible together at bedtime, parents can greatly improve their child’s experience of Confirmation. 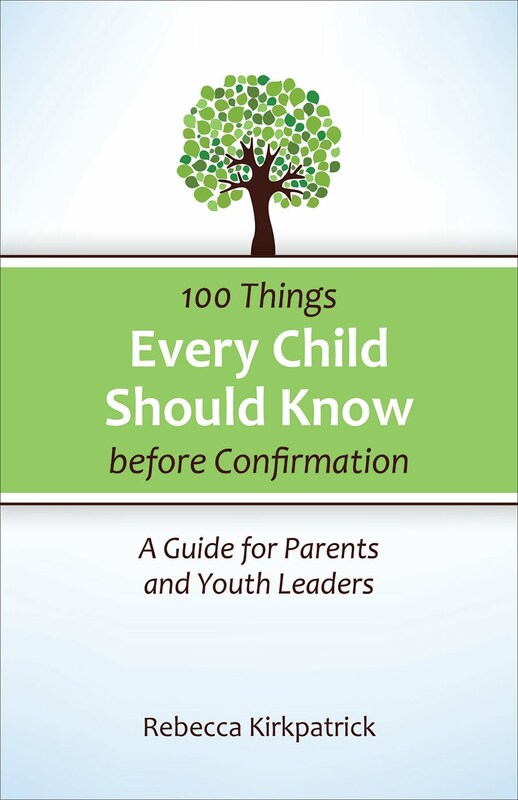 THE 100 THINGS YOUR CHILD SHOULD KNOW BEFORE THEY START CONFIRMATION CLASS. 1. The Bible is made up of many different books with different authors. This might seem obvious (be prepared for a lot of these to be obvious), but it is good to start with the most basic. Honestly, just sitting down for 15 minutes with a standard Bible in any translation, it is fairly easy to see that the Bible is broken down into multiple books. The problem is that we often don’t sit down with a regular Bible (not a children’s picture Bible) and look at the table of contents with our children. My son is now at the age where he is doing his first “research” project, and this afternoon it took him all of ten minutes to learn how to look something up in an index. I am pretty sure he has now mastered the skill. Teaching a child how to find something in the Bible is just as simple. In Confirmation class this topic is taken to the next level as we talk about different types of biblical literature like Histories, Laws, Wisdom, Prophets, Letters and Poetry to name a few. In a successful class we also talk about issues of authorship and how the faith community decided to put the books that are in the Bible IN the Bible. 2. Much of the Bible comes from ancient oral tradition. It is hard to teach a child the subtle difference between facts and truth, which is something that we try to do in Confirmation class, but it is helpful if students already understand that ancient stories in the Bible developed in ways similar to other ancient stories that they have learned in school. When we talk about stories from the Bible with children and youth we can always remind them that we tell these stories because generations of people before us have told these stories about God, and that even before they were written down people made sure to tell the stories to one another so that they had a way to understand God together. By the way, this applies to the stories in the Gospels as well, since we know that stories about Jesus were told for at least a generation after his death before the Gospels we have in the Bible today were written down. In Confirmation class we talk about what it means that the Bible is inspired by God and how we can understand its importance as a guiding influence for our life of faith. 3. The Old Testament is the story of the Israelite people. Again another obvious one, but it is still clearly an important lesson. Students can be confused because they know that Christians trace their roots through the Jewish tradition and they know that there are still Jewish people today, but they don’t make the connection that we share these stories – that they were Jewish stories before they were Christian stories. In the same way that you can sit with your child and look at how the Bible is put together, you can take your child to either a map inside a Bible or just a world map and look together at where Israel is/was. Look together at its proximity to Egypt and remind them of the stories of the Exodus. In Confirmation we talk about the first-century Christians, some of whom were Jewish (including Jesus) and some of whom were not, and how they struggled to work out those differences. 4. The New Testament is the story of the life of Jesus and the early Christians. Every student should know that a Gospel tells the story of Jesus’ life. I am much more forgiving when it comes to working out the Book of Acts, the Letters of Paul and all of the other New Testament literature, but the Gospels are a must. In Confirmation we learn about the origins of the Gospels, their unique voices and how they each tell the story of Jesus’ life and teaching in slightly different ways. 5. There are many different modern translations of the Bible. The first step is to explain to children that the Bible was written originally in Hebrew and Greek, so clearly anything they are able to read is a translation. Depending on your tradition, you may prefer to teach your child from one translation over another, or your church may prefer one over another. I can remember when the New Jerusalem Bible translation came out and my Dad bought or received a copy (I don’t remember which) and how cool it was to have a different translation in our home. I also remember finding among my parents’ books the popular 1970’s paraphrase called “The Way,” which seemed so radically different to me that it begged to be read. Introducing different translations can be a great way to motivate children to read the Bible more carefully. In Confirmation class we talk about how different translations can serve different purposes (study, devotion, etc.) and how for those who are not able to read the Bible in the original languages, using multiple translations can help us think differently about what a passage might say by hearing it in different ways. So, five down… 95 to go. I have a basic outline of what I expect the rest of the list to include, but I would love to hear what you think should be on the list! Perhaps something along the lines of there are more similarities than differences in the religions? That certainly is an important lesson to learn/teach. I often find that students already assume that all Christian traditions are the same. In some ways as we move away from most folks identifying with denominations that may actually be the case. I think that really digging into the world religions and their distinctives are the deeper conversations that we can have once they are in the class together. That being said, there are some wonderful resources to use with children to help them understand the basics of the major world religions both the differences and similarities. My priority is to focus on how we can keep from teaching things that will need to be untaught as children grow in their faith and understanding. Really like your list! I wish the parents knew this much. With only slight modifications, I will find it very useful... Thanks! I'm going to keep your name on this, and use it in my 3rd-5th grade Sunday school class! Thanks! We are created in God's image, and therefore good! Just found your post and really enjoyed reading it. Any plans on continuing past the first 5? You talk about the adults teaching the kids at home. In my 29 year experience I have found that most parents don't know the list themselves. I have often thought that conformation needs to be a family affair.